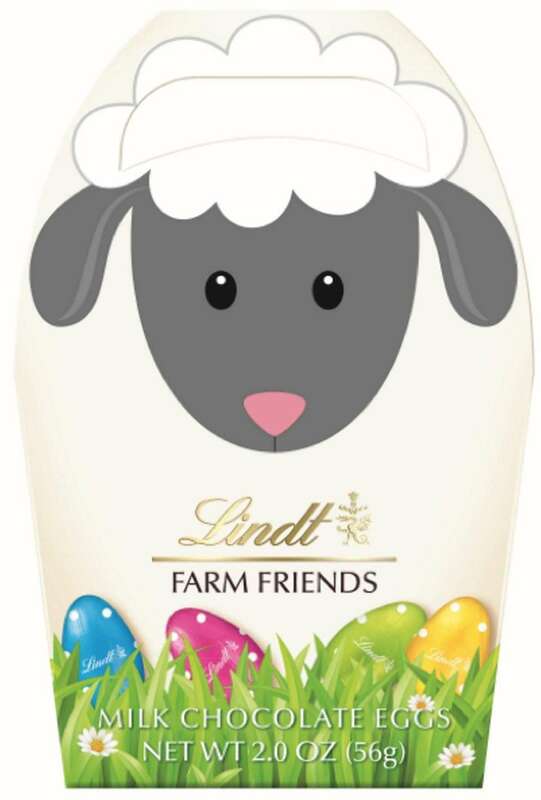 From iconic marshmallow Peeps to jelly beans and fun-to-eat chocolate bunnies, here are new Easter candy and sweet treats, perfect for filling up kids' baskets this year. 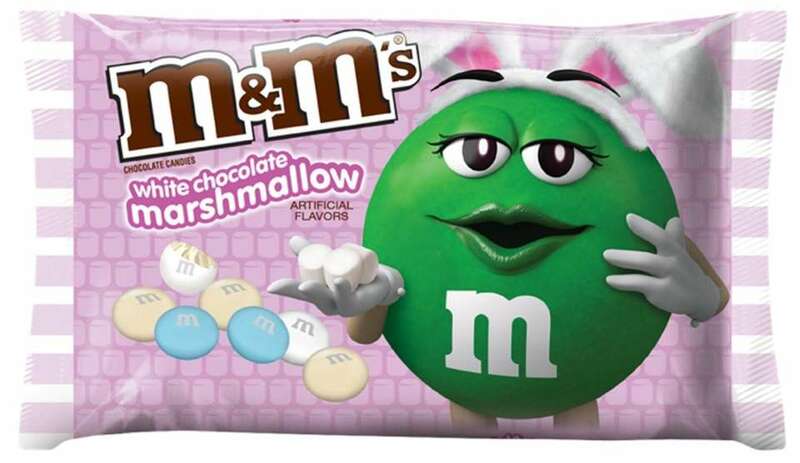 The new pastel-colored M&M's for the season are made with marshmallow flavor and white chocolate, covered in a crunchy candy shell. Price: $3.19; exclusively at Target. 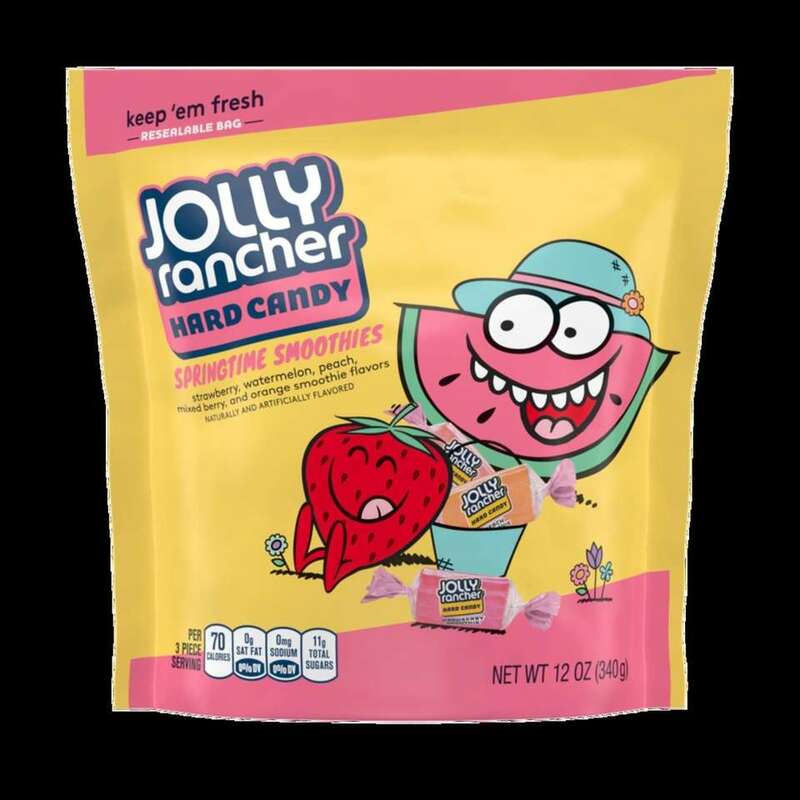 A new bag of this hard candy's springtime favorites include strawberry, watermelon, peach, mixed berry and orange; $2.79. 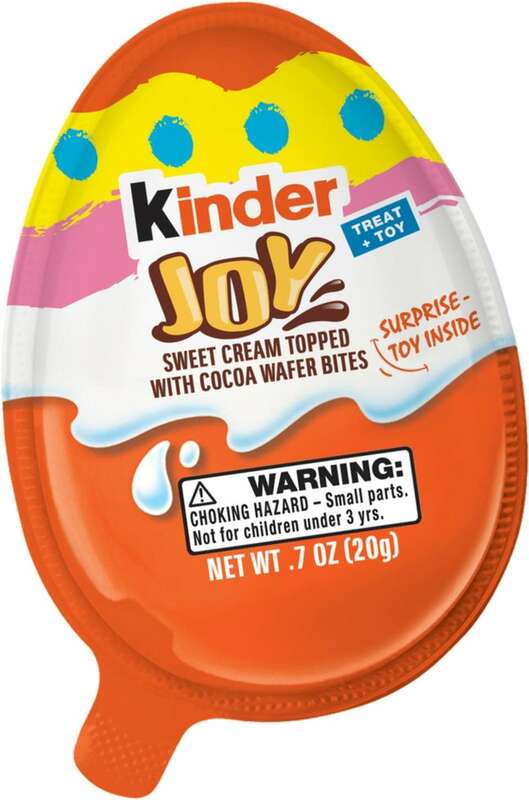 Inside the Kinder Joy Egg are two separately sealed halves with cocoa cream and milk topped with waffers on one side and a surprise toy on the other; $1.49. 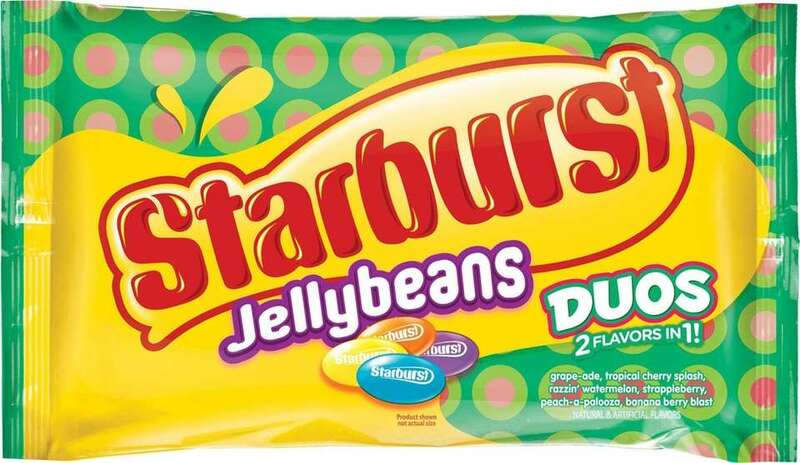 Starburst put a spin on classic jelly beans, by combining two flavors in one. New flavors include Grape-ade, Razzin' Watermelon and Tropical Cherry Splash; $1.99. 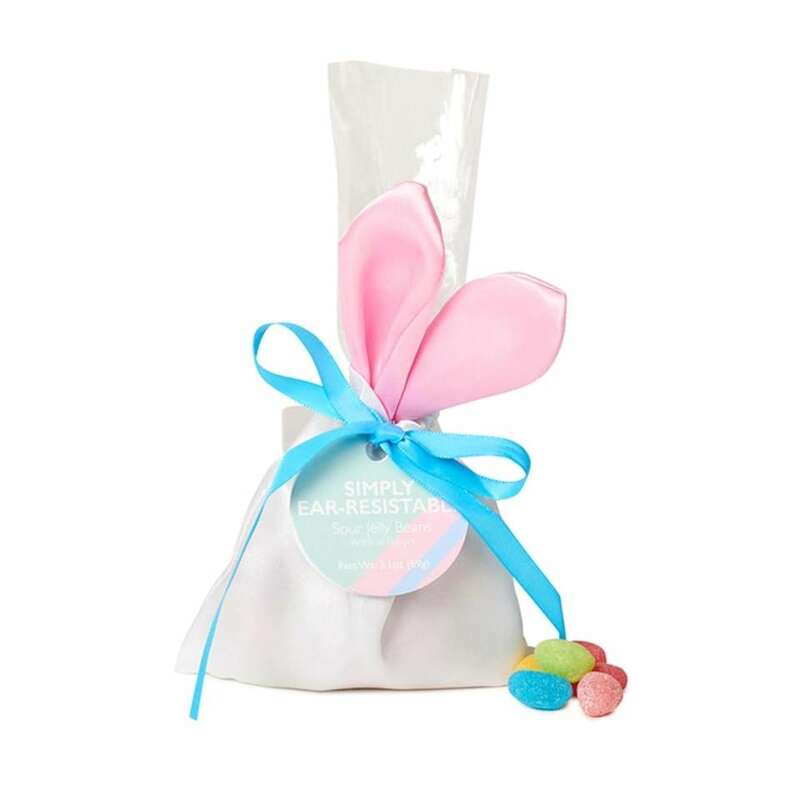 These sour jelly beans come packaged in a silk bunny bag with pink bunny ears and a carrot-shaped hangtag; $7 at dylanscandybar.com. 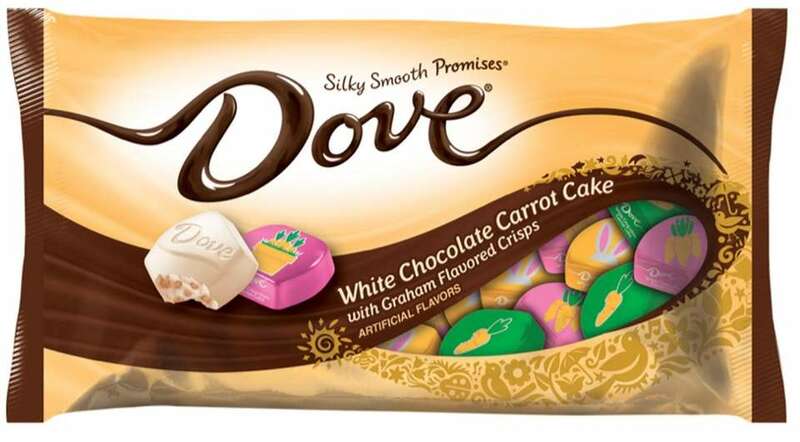 This Target exclusive spring-themed white chocolate carrot cake candy features graham flavored crisps. Price: $3.99. 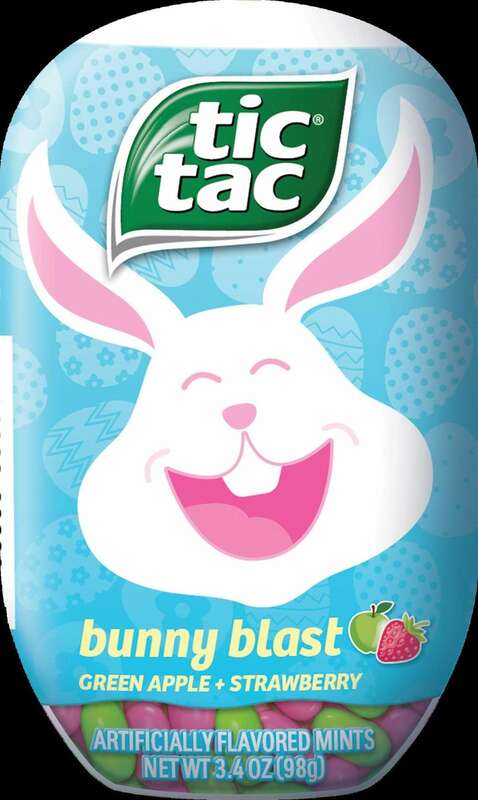 Tic Tac's seasonal candy includes Bunny Blast with green apple and strawberry flavors, and Birdie Bash with passion fruit and green apple flavors; $1.39. 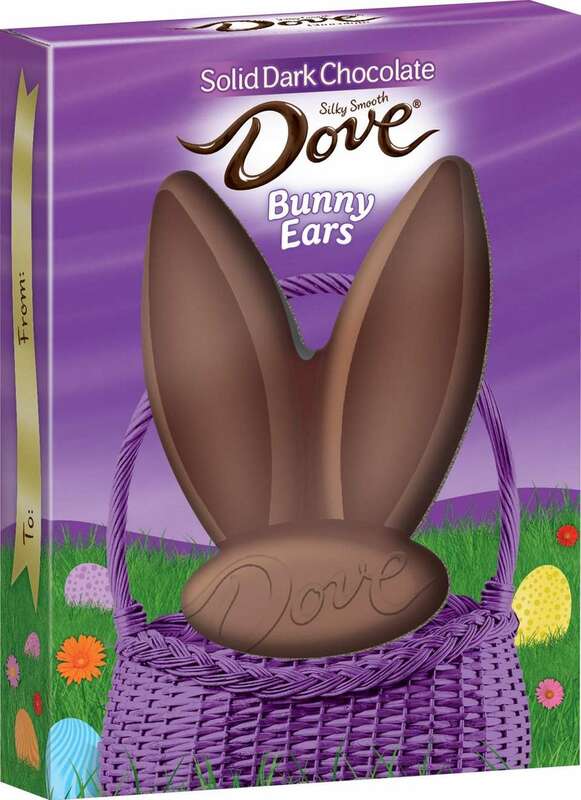 Traditional Dove dark chocolate now comes in large bunny ears; $1.99. 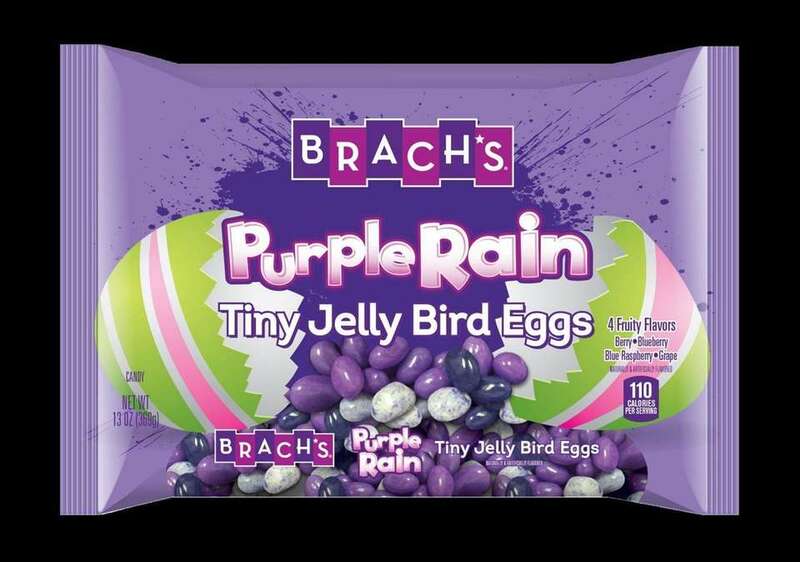 These jelly beans come in different shades of purple in berry, blueberry, raspberry and grape flavors. Price: $2.69. 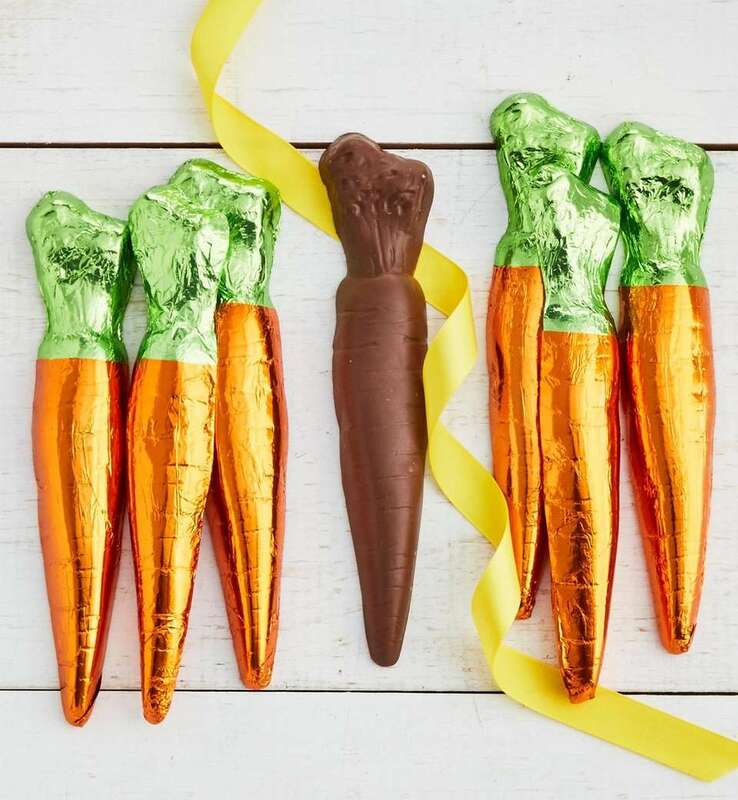 A bunch of six milk chocolate carrots arrive wrapped in bright orange and green foil. Each chocolate carrot is more than seven-inches long. Price: $29.99 at simplychocolate.com. 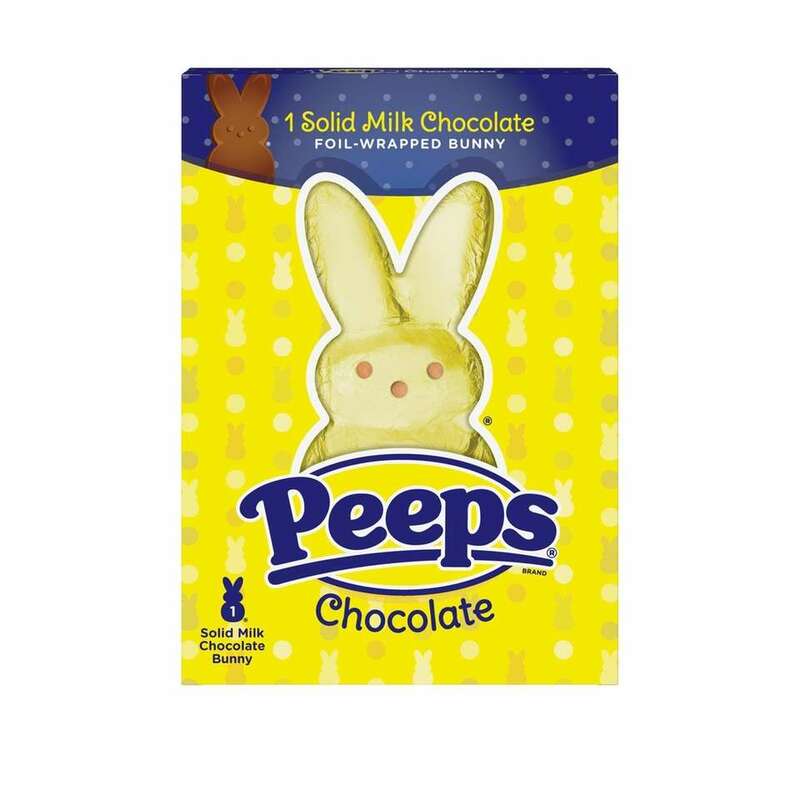 Peeps are best known as marshmallow bunnies, but now come in a solid milk chocolate bunny wrapped in layers of colorful foil. 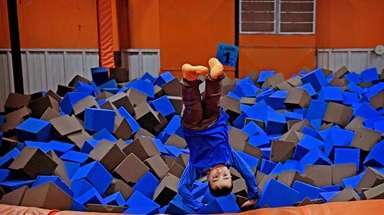 Price: $3.75-$5.50. This fun pop features four different Peeps chicks in pastel colors. Price: $1.99; $2.49 for a 4-pack. 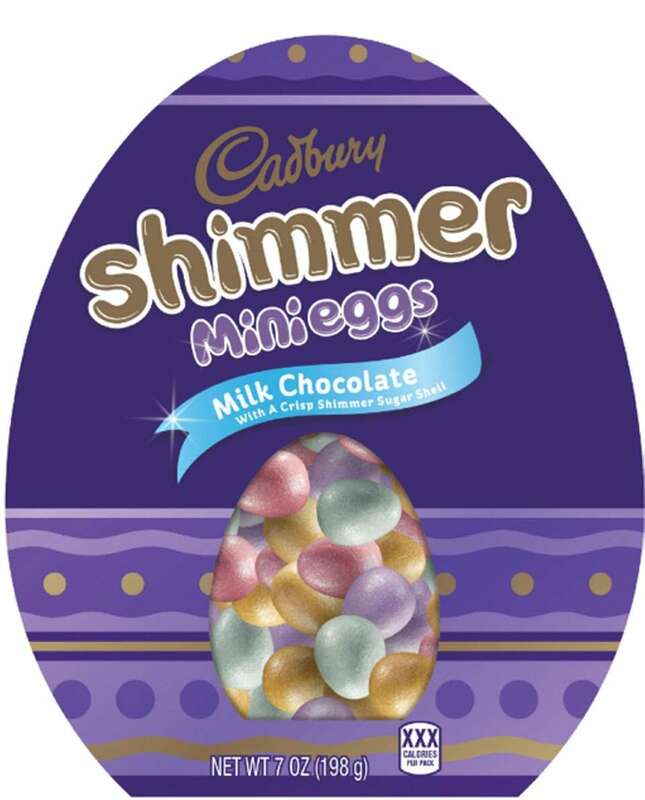 These new mini milk chocolate eggs feature a crunchy shimmer sugar shell in pastel colors. Price: $4.99; exclusively at Target. 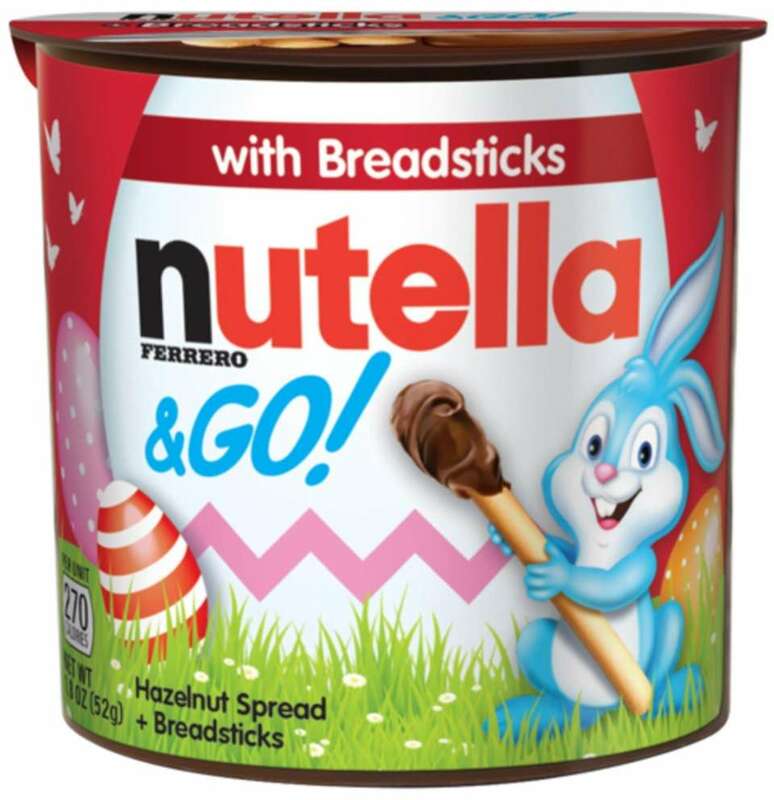 Nutella on-the-go packs feature bunny or chick packaging for Easter. The snack packs come with either breadsticks or pretzel sticks; $1.49. 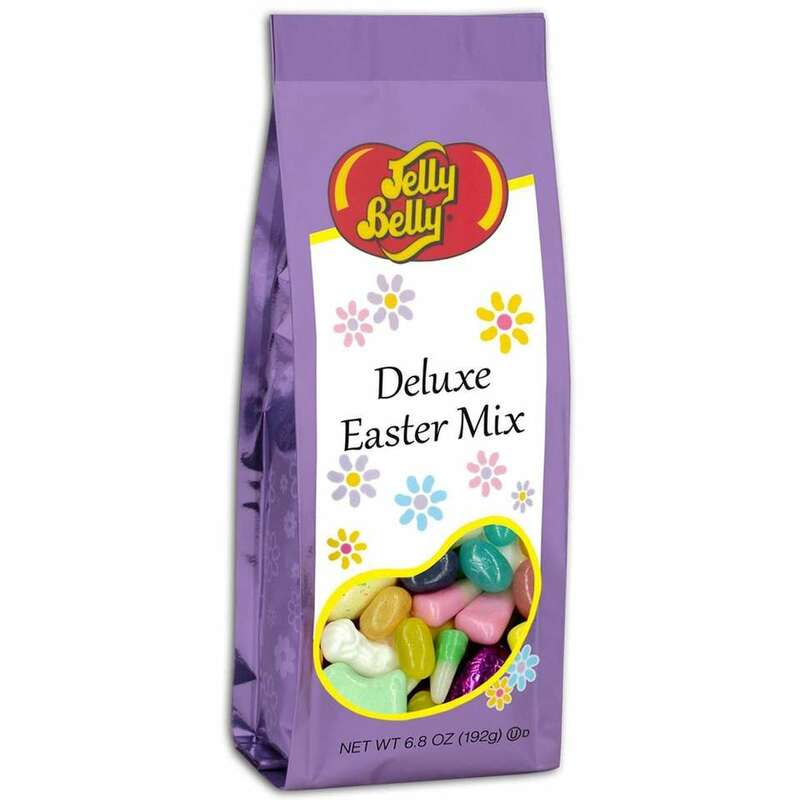 This seasonal candy mix includes Jelly Bean Spring Mix, Bunny Corn, Easter Mellocremes, Speckled Chocolate Eggs and Foil-Wrapped Solid Chocolate Eggs. Price: $6.99. 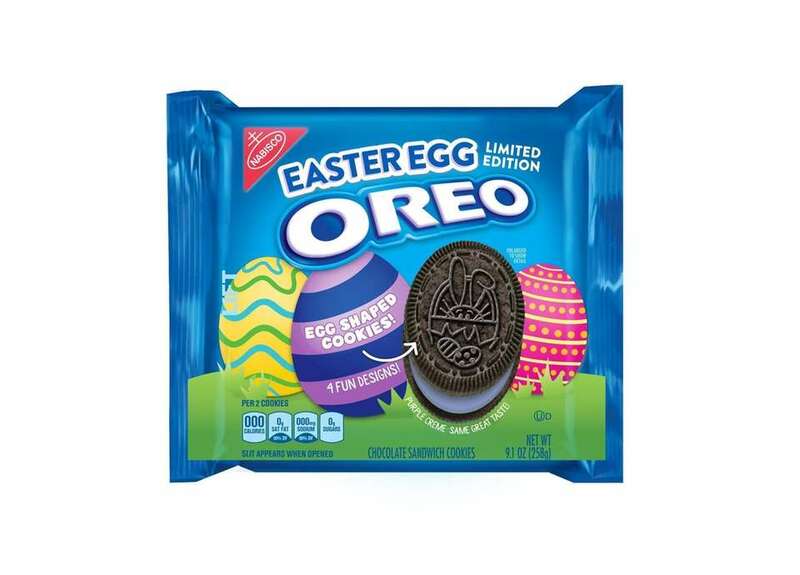 Oreo is unveiling a special Easter-inspired cookie with purple cream in the center and four different designs. Price: $2.99. 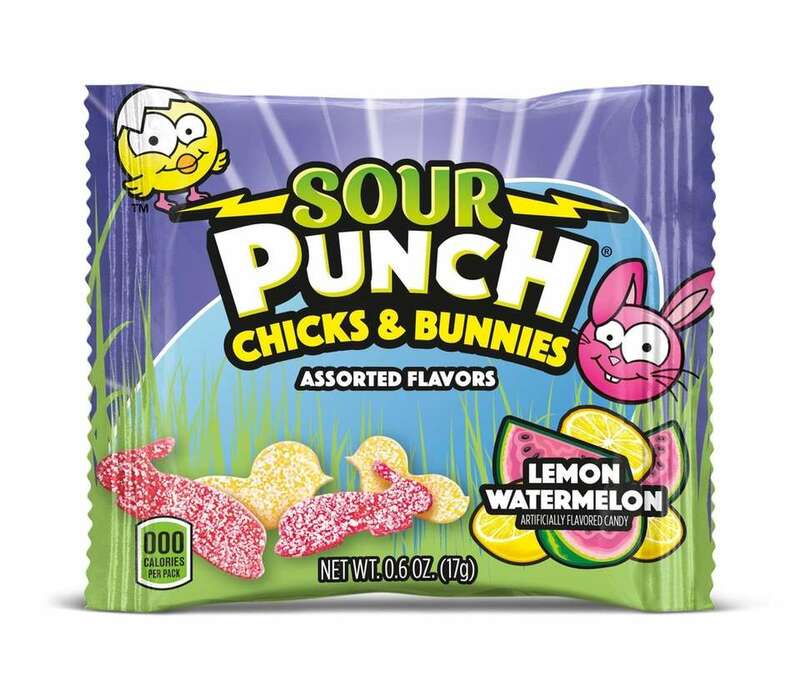 Great for Easter baskets, the Sour Punch gummy candies are available in small, individual packages. The bite-sized treats are shaped as chicks and bunnies, and come lemon and watermelon flavors. Price: $2.69. 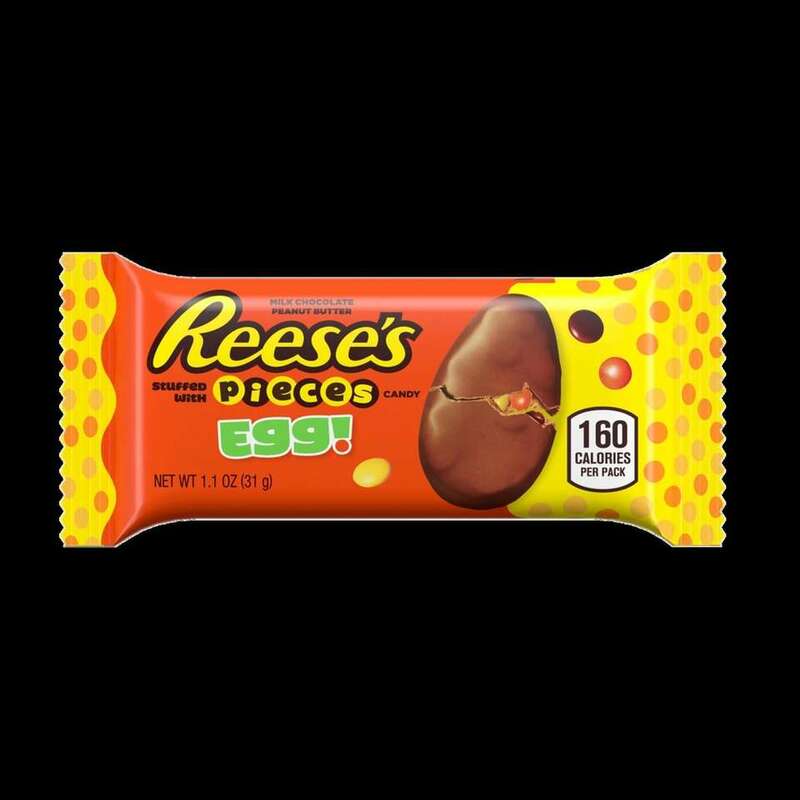 These peanut butter egg-shaped chocolate candy are stuffed with Reese's Pieces candy; $0.99 for one, $4.29 for a 6-pack. 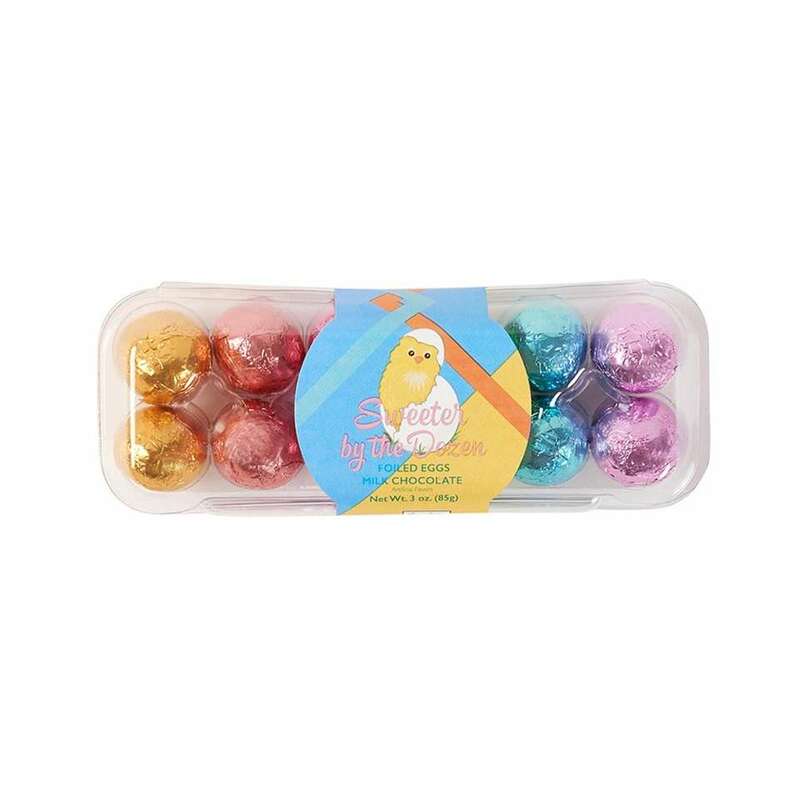 This set features a dozen solid milk chocolate eggs wrapped in colorful foil. Price: $5. 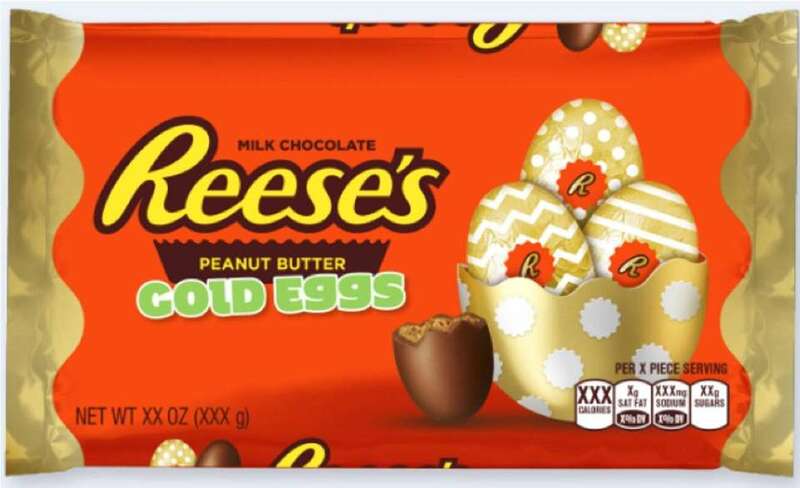 These Easter-themed Reese's Peanut Butter cups are shaped like eggs and wrapped in gold foil. Price: $3.59. 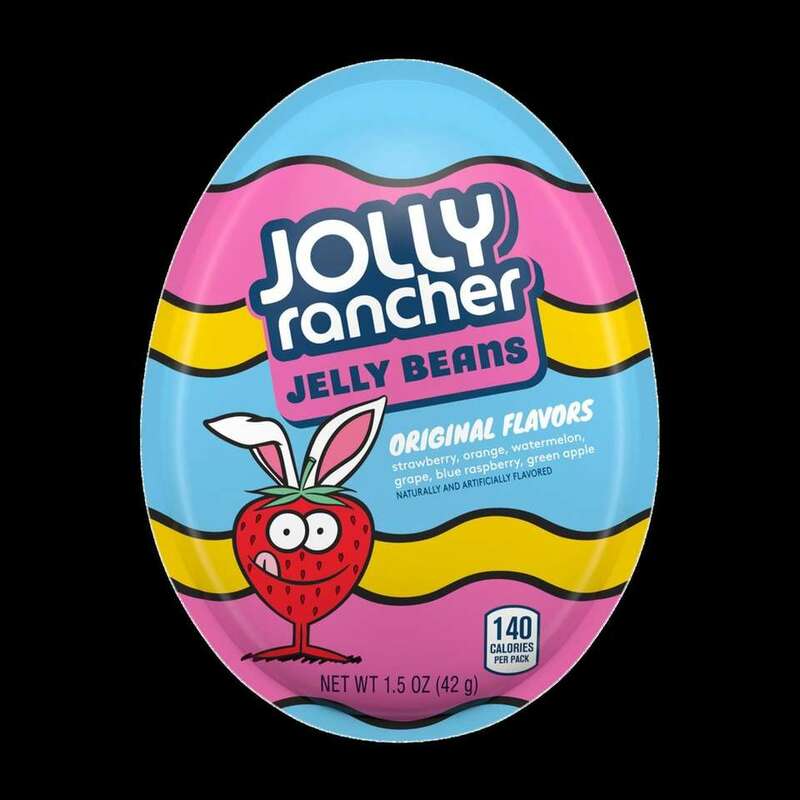 Only available during the Easter season, the egg-shaped container holds Jolly Rancher jelly beans in strawberry, orange, watermelon, grape, blue raspberry and green apple flavors; $1.39. 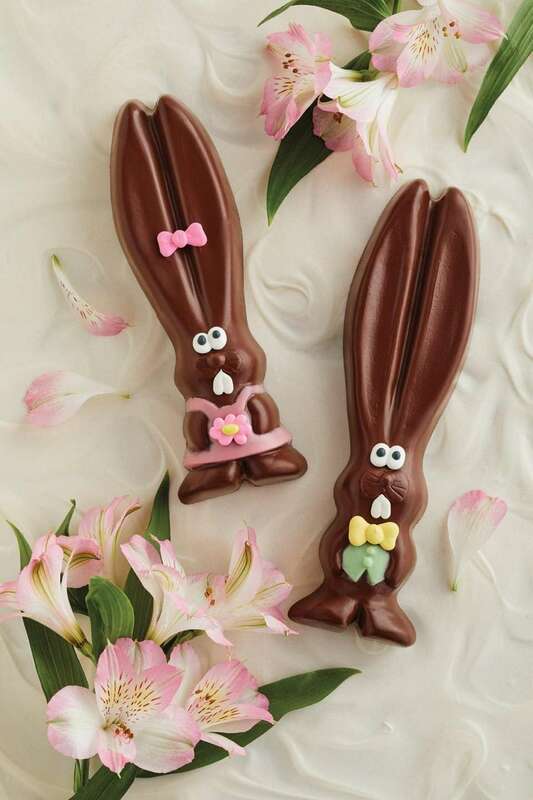 The pair of Easter bunnies are decorated in their seasonal best and made with the same milk chocolate Harry & David uses in their truffles. Price: $34.99 at harryanddavid.com. 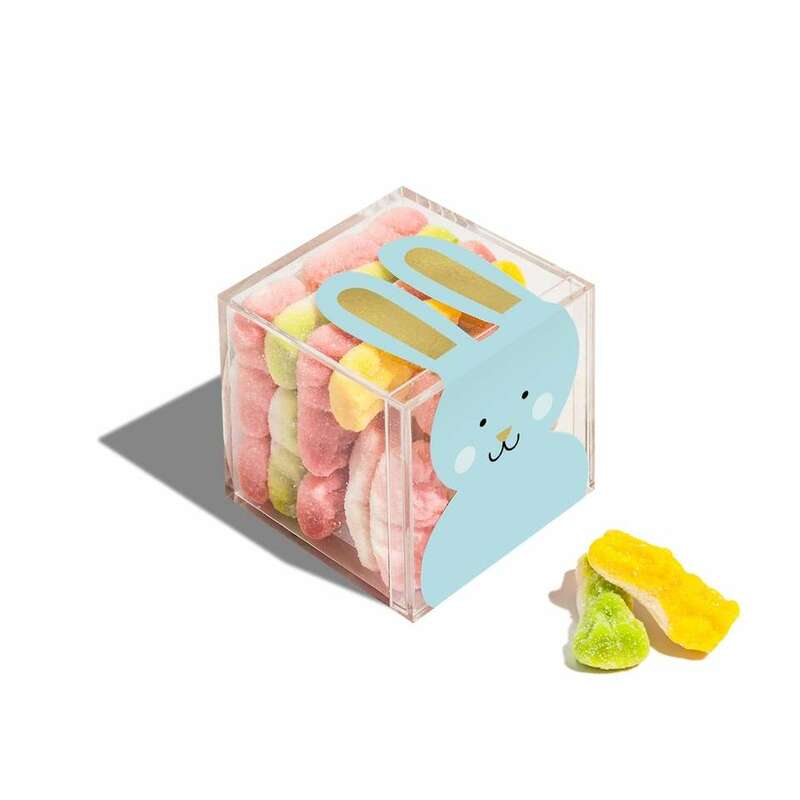 In this festive clear box, find fruity sour bunnies with fluffy marshmallow tails; $8.50 at sugarfina.com. 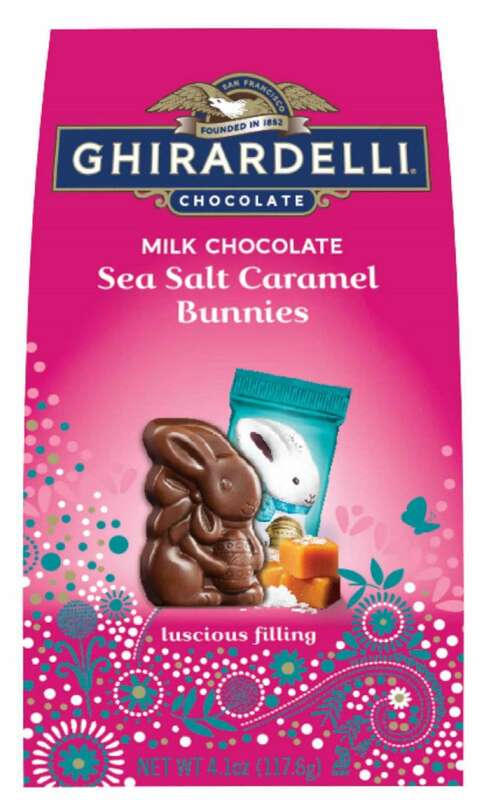 Perfect for Easter, Ghirardelli turned their sea salt caramel squares into bunnies. Price: $3.99. 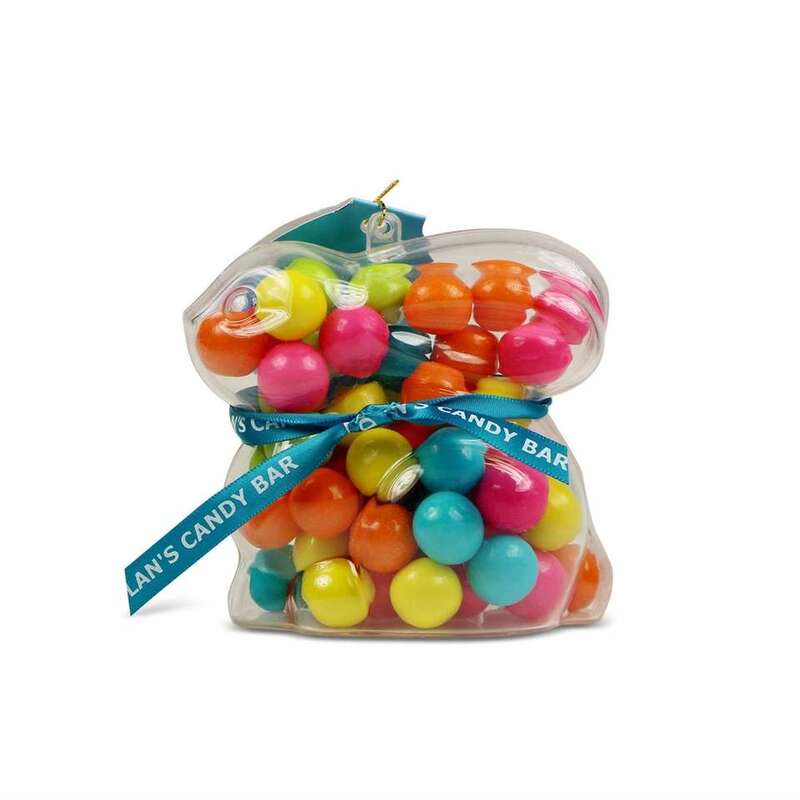 This clear bunny container holding a bunch of colorful gumballs is a Target exclusive. Price: $3.99. 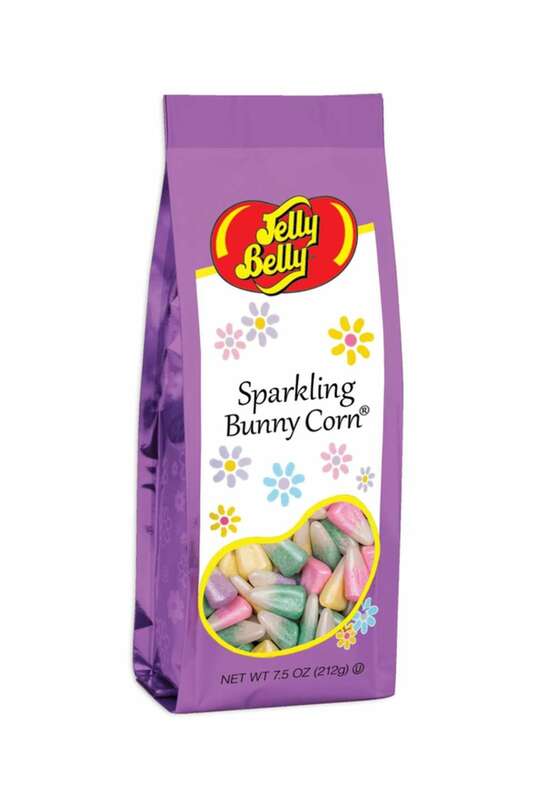 Pastel pink, green and yellow candy corn come in vanilla mellocreme flavor; $6.99 at jellybelly.com. 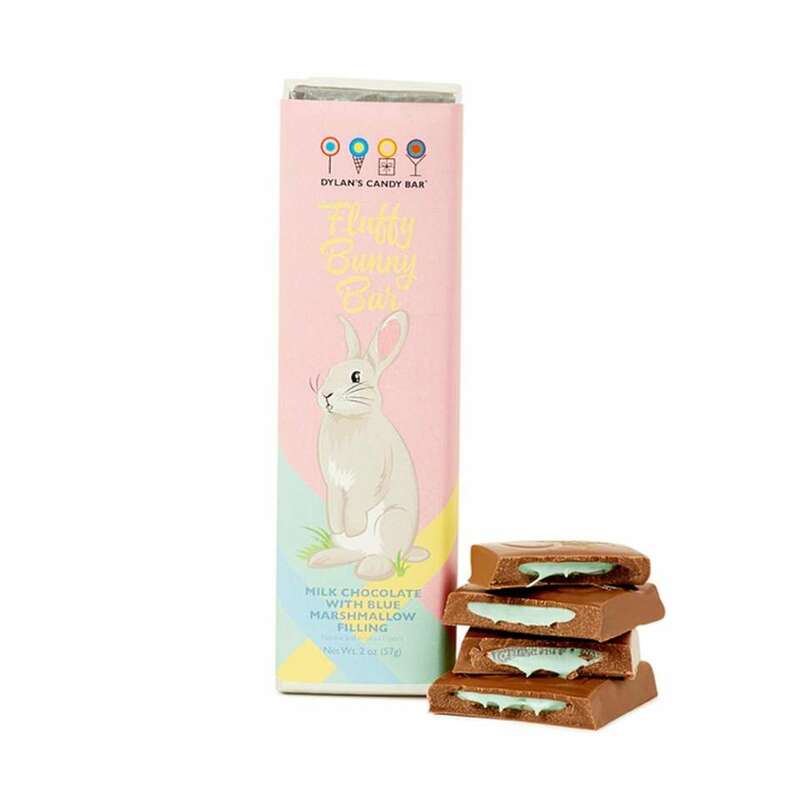 This milk chocolate candy bar is filled with pastel blue marshmallow; $3.25 at dylanscandybar.com. 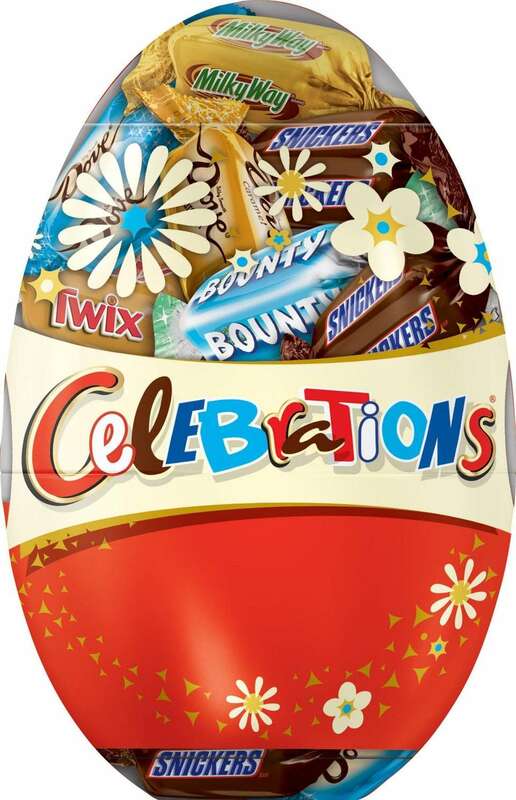 This surprise candy egg comes with mini Snickers, Dove, Twix, Milky Way and Bounty; $3.99. 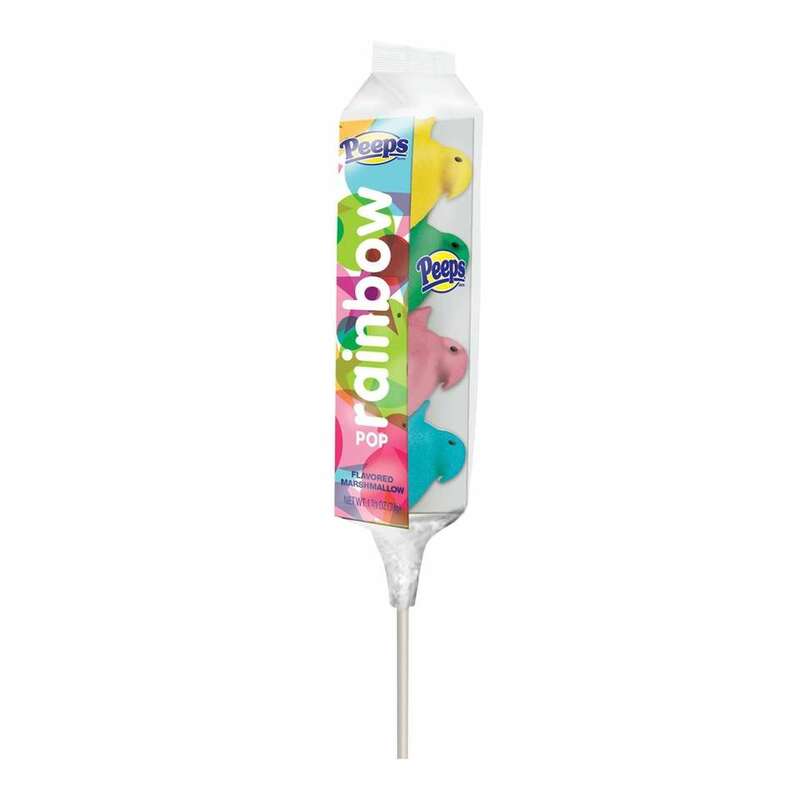 These sour fruit-flavored candy chews come in a tube topped with crazy hair and bunny ears; $2.29. Twix Minis come in a large cane with bunny ears, perfect for the Easter basket; $2.49. The new marshmallow Peeps feature flavors from classic breakfast foods: pancakes and syrup; $1.69 for a 10-count package at major retail stores. This Easter-themed treat box features 28 individual packages of fruit snacks in fun shapes including a chick, egg, flower and bunny; $4.99 for a box of 28 at Target and other retail stores. How to make Ukrainian Easter eggsAs Easter approaches, Ukrainians decorate traditional eggs using dyes and a beeswax called Pysanky to create works of art that can last for years. 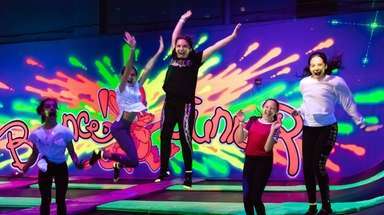 (Credit: Newsday / Chris Ware) Easter bunny visits, egg hunts, more spring fun on LIFind out where the Easter Bunny will be hopping around LI. 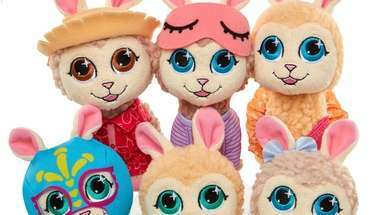 Fun Easter basket gifts to buy nowForget chocolate bunnies and jelly beans. 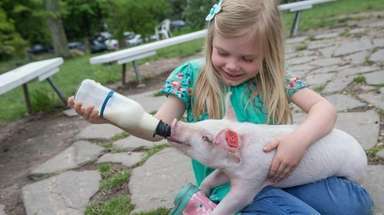 If you are tired of the same old stuff, why not fill this year's Easter baskets with fun, spring-themed toys and books? 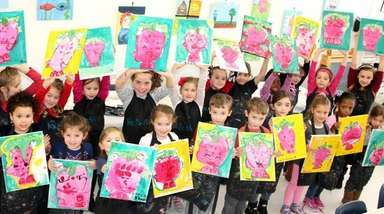 35 family-friendly things to do this spring on LI Great spots to plan a fun day outdoors.